There’s more than a chill in the air here in Philly – there’s snow on the ground and it’s only mid-November. While the official start of winter is still weeks away, the holiday season will be here in no time and there’s no shortage of events for residents and visitors alike to check out as they welcome Christmas once again. Some of the events are decades-old traditions while others are relative newcomers. Either way, an afternoon spent strolling through an “authentic German Christmas market” is always enhanced by picking up the best Philly cheesesteak afterward. If you’re already planning your holiday-related outing in the city for the month to come, we’ve gathered some timely info to help make those treks a bit more enjoyable. Philly Holiday Festival: Since Santa Claus’ appearance at the end of our Thanksgiving Day Parade is the official start of the Christmas season in Philly, the Nov. 24 lighting of the Philly Holiday Tree is the perfect complement. The 65-foot-tall tree – topped with a Liberty Bell, naturally – is weighed down by a 30,000-pound steel base. 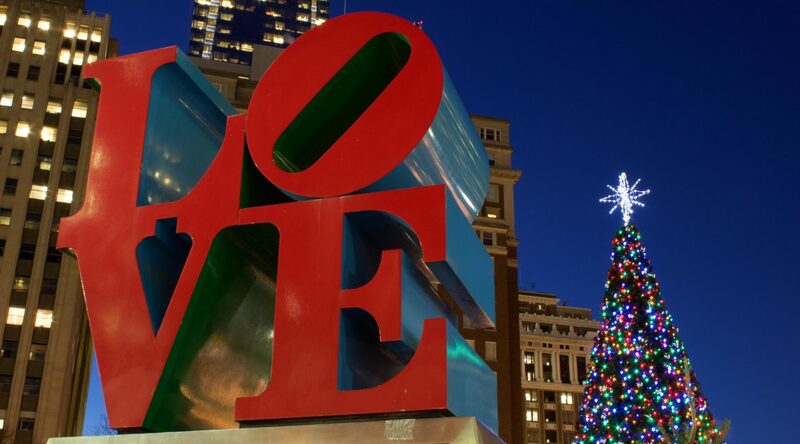 According to PhillyHolidayFest.com, decorations on the tree include “bald eagles flying a banner across the tree that reads ‘Love’ in languages from all over the world.” The lighting ceremony is from 5 to 7 p.m. on Nov. 24 at City Hall. Christmas Village: Across the street from City Hall, LOVE Park will again host the annual installment of Christmas Village. From Nov. 22 through Christmas Eve, shoppers can stroll through an outdoor village that has been “modeled after the traditional Christmas Markets in Germany,” according to PhilaChristmas.com. More than 80 vendors in wooden cabin-like structures will be selling goods to shoppers who are crossing off recipients from their gift list. Among the items that shoppers can select from are arts, crafts, glass and pottery, jewelry, toys, fashion items and traditional foods such as roasted nuts and traditional chocolates. However, the best Philly cheesesteak is the lunch or dinner to grab after a leisurely stroll through the village. Just make the short drive down to Geno’s at 9th Street and Passyunk Avenue for a “whiz with” that’s sure to fill any shopper’s stomach. Additional Nearby Attractions: There are dozens of other stops in Center City worth making – before or after you’ve picked up the best Philly cheesesteak from Geno’s. These include ice skating at Dilworth Park, the Comcast Holiday Spectacular 15-minute light show, the newly-opened Cherry Street Pier, Macy’s Christmas Light Show and 14-foot-tall Christmas tree at the Betsy Ross House in Old City.